SAN FRANCISCO--(BUSINESS WIRE)--Fitbit (NYSE: FIT), the leading global wearables brand, today introduced a new premium guidance and coaching paid offering designed to analyze your Fitbit data and activity level to deliver a custom curriculum of workouts, programs, content and other tools tailored to your specific goals. The first tools to launch with this offering include a new Fitbit Coach app, which rebrands the current Fitstar Personal Trainer app and combines its popular dynamic video workouts with new Audio Coaching sessions, expert-designed to help you increase endurance, speed and form. We’re also introducing Guided Health Programs, which provide step-by-step guidance, personalized insights, educational tools and rewards to influence positive behavior change and health outcomes. Throughout 2018 and beyond, Fitbit’s new premium offering will grow to include advanced tools with a library of programs and workouts developed with Fitbit’s Advisory Panel, to deliver adaptive health and fitness coaching personalized to you. Today, Fitbit also announced Fitbit Ionic, Fitbit Flyer™ and Fitbit Aria 2™; see all press releases and download images at www.fitbit.com/press. Fitbit helps people lead healthier, more active lives by empowering them with data, inspiration and guidance to reach their goals. As the leading global wearables brand, Fitbit designs products and experiences that track and provide motivation for everyday health and fitness. Fitbit’s diverse line of innovative and popular products includes Fitbit Surge®, Fitbit Blaze®, Fitbit Charge 2®, Alta HR™, Alta®, Fitbit Flex 2®, Fitbit One® and Fitbit Zip® activity trackers, as well as the Fitbit Ionic™ smartwatch, Fitbit Flyer™ wireless headphones and Fitbit Aria® and Fitbit Aria 2™ Wi-Fi Smart Scales. Fitbit products are carried in 55,000 retail stores across 65 countries around the globe. 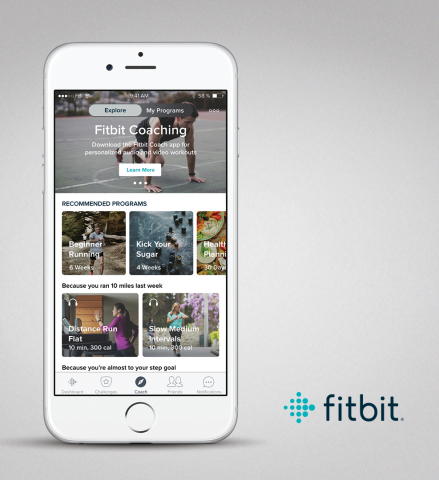 Powered by one of the world’s largest social fitness networks and databases of health and fitness data, the Fitbit platform delivers personalized experiences, insights and guidance through leading software and interactive tools, including the Fitbit and Fitbit Coach apps, Guided Health Programs, and the Fitbit OS for smartwatches. Fitbit Health Solutions develops health and wellness solutions designed to help increase engagement, improve health outcomes, and drive a positive return for employers, health plans and health systems. This press release contains forward-looking statements, within the meaning of the safe harbor provisions of the Private Securities Litigation Reform Act of 1995, that involve risks and uncertainties including, among other things, statements regarding the future availability and growth of the Fitbit personalized guidance and coaching offerings described in this release, including Fitbit Coach and Guided Health Programs. These forward-looking statements are only predictions and may differ materially from actual results due to a variety of factors, including the effects of the highly competitive market in which we operate, including competition from much larger technology companies; any inability to successfully develop and introduce new products, features, and services or enhance existing products and services; product liability issues, security breaches or other defects; and other factors discussed under the heading “Risk Factors” in our most recent report on Form 10-Q filed with the Securities and Exchange Commission. All forward-looking statements contained herein are based on information available to us as of the date hereof and we do not assume any obligation to update these statements as a result of new information or future events. 1 Based on anonymous and aggregated user data, 2017. 2 Fitbit Coach video workouts will be available in English, French, German, Portuguese and Spanish this fall. Audio Coaching workouts will be available in English in the Fitbit Coach app this fall, with French and German languages coming soon. Guided Health Programs will be available this winter in English in the Fitbit app.